Magnolia is the band of Swedish guitarist, Ronny Eriksson. 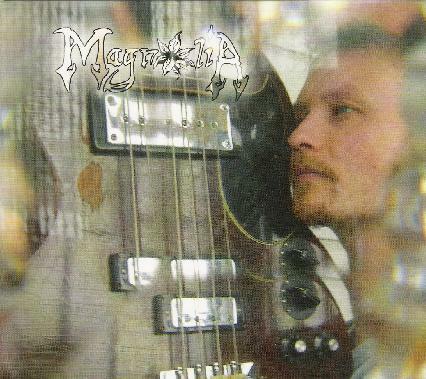 This CD was recorded over the last 3 years in Love Tholin's Dropout Studio in Åmål, Sweden. The CD is highly influenced by the hard rock bands of the late 60's and early 70's like Cream, November, Mountain, Buffalo, etc. Anyway, this record has plenty of great guitar and some killer riffs and jams. All the lyrics are sung in Swedish. There are a couple of instrumental tracks as well and one features trombone! Track 6 is one of the best and features guest guitarist, Jack Vreeswijk, and some great guitar duals. Amazing stuff. If you are a fan of the heavy early 70's blues rock stuff you can't go wrong with this great CD. Loads of lead guitar and a great sound. This CD really grows on you as well, even if you don't understand Swedish! For more information you can visit the Magnolia web site at: http://www.myspace.com/magnoliarock.